What Have You Gotten Yourself Into Janet Maple? The Jack Russell Terrier? That’s Janet’s dog, Baxter. He does not help solve any crimes. It seems as if Janet Maple is realizing she should have stayed unemployed, instead of taking a job with her friend Lisa Foley. 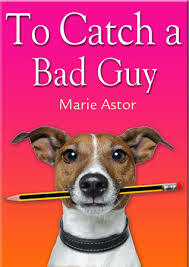 Some more of “To Catch a Bad Guy” by Marie Astor…. Immediately at the start of Chapter 7, Janet is trying to figure out if Bostoff is a clean company, or if they are crooks. After a week on the job, she had not had 1 single task that she could take credit for. In the meantime, Lisa gets engaged to the Boss’s son, Paul Bostoff, just as she predicted. Likely something to irritate Janet some more, no doubt. Big brother Jon isn’t too thrilled about it either. An upcoming SEC audit has Janet looking over some client files to verify everything is in order; missing addresses and ownership information was not a good sign. And then we are back to Dean/Dennis for a moment. He begins contemplating bringing Janet in on what he is doing there; he believes she would be a good ally and could help him blow the case wide open. Chapter 10 pretty much clears the air that Jon and Tom are both the ones behind whatever the illegal activity is that is going on, and Paul really doesn’t know anything about it at all. (I’m getting the feeling there are going to be a few people in this story who were in-the-wrong-place-at-the-wrong-time, including Janet and Lisa). Next we dig into a bit of Dean/Dennis’s background, and learn that he himself was once in finance, he went to work for a less-than-honest company. Once he was let in on the secret, he was approached by the Federal Government before he could find employment elsewhere. They offered him a deal to help them with their investigation, give up his securities licenses, and they would not prosecute him any further. He really had no choice. Janet brings up her concerns to Lisa, who could not care less; telling her to let the operations department deal with it. Janet tells operations she was granted access, so operations hands her a password to information she really shouldn’t be seeing. An engagement party at Lisa’s parent’s home, and a cousin of Lisa’s who turned into the same jerk he was when they were growing up put quite the damper on Janet’s evening. Lisa doesn’t seem to think she is responsible for anything, and the two end up barely speaking. Jon Bostoff agrees to take part in a shady deal with a client, for the largest amount of money he’s ever risked. This could be the one that brings him down. Janet meets Dean/Dennis at a bar, not knowing he knew she would be there and he planned it all. After a pleasant evening together, she asks Dean if he noticed anything odd about the company they work for. He chose that time to say his good-byes for the night. Tom later spends a quiet evening trying to woo Janet, but his intentions are mainly to make sure she knows nothing about the scheming Jon and he are doing. Dean/Dennis tells Janet who he really is, and she is furious; feeling as if she had been used for information. Now she needs to tell Linda, who won’t shut her mouth (my words) about her wedding. Janet tries to tell her; and never gets the chance. She agrees to help Dean/Dennis, but only if he keeps Lisa and Paul out of Jail. Lisa he can promise to, but not Paul, he is too high up on the food chain, even if he really knows nothing. So, the fall is about to happen; how many are going to get taken down?